The new LE collection is here. There is one notable thing about this collection, it's not grunge/90's style like we were promised. It feels more like a wild west/bohemian style. I was away when it got released so I missed the two items I liked, the "Electra Fringe Shawl" and the "LE Chiffon Vest". However I still got some things, only accessories though. I got the "Diamond Rivets Hat" and the "Chain Dallas Hat". They are not something special, but I bought them eitherway for my hat collection.. I also bought two pair of shoes, the "Celine Wedges" and the "Sherriff Snake Wedges". At first look I didn't like them but I have saved some stardollars for LE, which I wanted to spend. 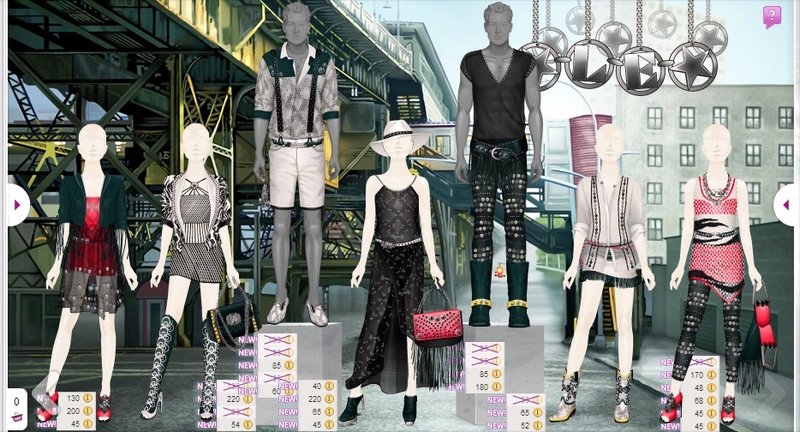 So I got them through Stardoll Access after many hours and with without thinking about it too much, just for the sake of it. I can honestly say that I don't regret it at all. I'm in love with the "Celine Wedges", they are beautiful and unique with the quirky heel! I wore them right away, and I'm sure I'll get a lot of wear from the other pair too. haha I was awake super-early yesterday and I got lucky for I was there the moment when everything was available. I'm a true Kate Moss aficionado, and I got so disappointed when I saw this collection (I mean, I feel like Stardoll is kinda boycotting her, right ?).. I reminds me of the Cohen Bros movies (NO Country for Old Men etc. ), but I'm not sure if I like it or not..